It's been just over two months since I made the change over to Weight Watchers. I've been doing some thinking about stats vs actual weight loss and while I do sense a change in the shape of my body, I think by putting stats down in print, it will help me acknowledge personal success better. 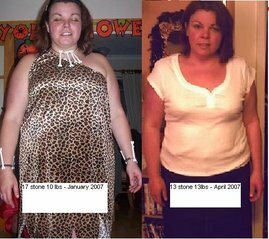 Weight - a loss of 33lbs! Chest - decrease in 4" from 48" to 44"
Waist - reduced by 3" from 43" to 40"
Size: - while a size 22 was too tight to be comfortable in January, I'm slowly slipping into size 20 and the occasional 18! I have measured my thighs this time around and at 27" each, I've realised that they have more girth than 22" waisted waif and size zero queen Victoria Beckham!! Oh dear! Well, I haven't managed much in the way of grocery shopping today. Instead, I went through my wardrobe and removed all items of clothing too big from it as I don't want any chance of needing them in future. Tomorrow we'll hit the shops and give the shopping list idea a whirl!